topic: Buildings and places, Where is the Center? 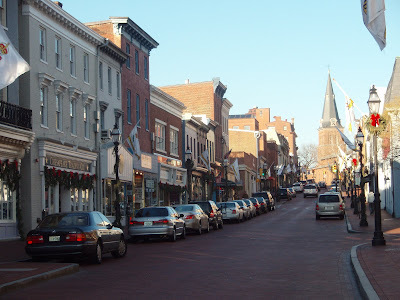 This weekend I visited some friends in Annapolis on my way back to Virginia, and I had some time to walk through many of the downtown streets. Witold Rybczynski writes about the the original plan for the town in his book City Life. When the governor of Maryland, Francis Nicholson, needed to found a capital for his colony, he did what many of the educated class in colonial America would have done; he drew his ideas from the baroque designs of the Old World, specifically Paris. Streets were laid out in a radial pattern, emanating from two major central squares. 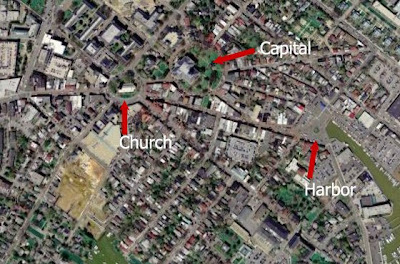 The plan clearly emphasized public space, with the institutions of civil government and church given the prime locations within the circles. Each street, even many of the alleys, had distinct terminus points providing a clear sense of direction and progress for those walking along it. 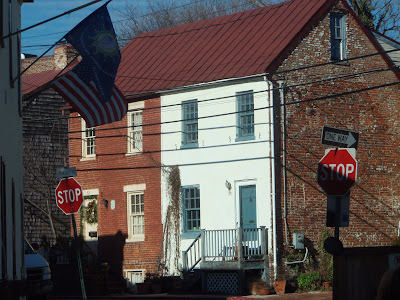 Thanks to extensive efforts of historic preservationists, the center of town can still be experienced in much the same way today. As it turned out, Annapolis and Williamsburg (the only other early baroque city in the U.S.) were commercial failures, and this tradition of urban design was thoroughly trumped by the more efficient and egalitarian grid of New York City. 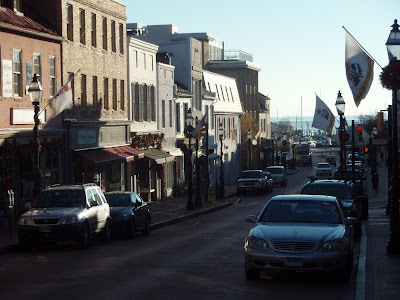 Looking down the commercial Main Street toward the Annapolis harbor. The water is a clear terminus point. The view from the other direction up Main street concludes with the Church at the top of the hill. The residential East street points to the State Capitol. Thanks for the trip journaling posts...I'm enjoying these. It's a great idea. Ah...those 18th c. planners! Funny had they could plan without a single year of theory or much ballyhoo over the likes of Gilles Delueze. 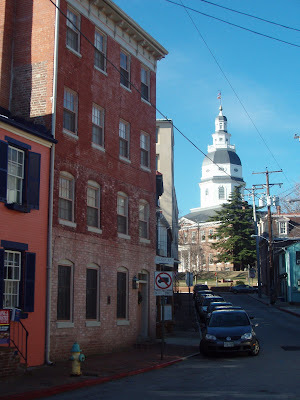 How the heck could they almost unconsciously create Annapolis, Charleston and Savannah? I think one advantage our predecessors had was that they were not yet slaves to orthogonal abstractions. They planned with the street perspective, first and foremost. The plan was just a diagram...for dialogue's sake. With the advent of SketchUp, you'd think things would start getting better. But I'm not finding much evidence of it.